The number of Americans filing new claims for jobless benefits jumped last week after three straight declines, another sign that the pace of layoffs has not slowed. 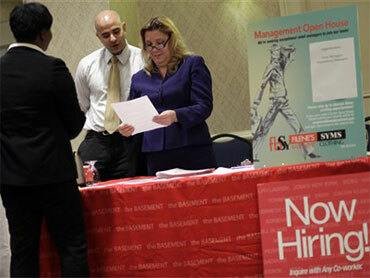 Initial claims for jobless benefits rose by 12,000 to a seasonally adjusted 472,000, the Labor Department said Thursday. It was the highest level in a month and overshadowed a report that consumer prices remain essentially flat. First-time jobless claims have hovered near 450,000 since the beginning of the year after falling steadily in the second half of 2009. That has raised concerns that hiring is lackluster and could slow the recovery. The four-week average for unemployment claims, which smooths volatility, dipped slightly to 463,500. That's down by 3,750 from the start of January. A lack of robust job growth has kept the recovery from gaining strength. Kevin Logan, an economist with HSBC Securities, said many economists have been expecting claims to fall below 450,000 for several weeks now. "The wait is getting longer and longer," said Logan. "As each week goes by, doubts about the underlying strength of the economic expansion grow." Economists say they will feel more optimistic that the economy is creating jobs once initial jobless claims fall below 425,000 per week. A separate Labor report said consumer prices fell for the second straight month. The 0.2 decline in the Consumer Price Index was pulled down falling energy prices - most notably a 5.2 percent drop in gasoline prices. Declining energy bills were the main factor pulling down prices. But core consumer prices, which strip out volatile energy and food, edged up 0.1 percent in May, after being flat in April. Core prices are up only 0.9 percent over the past year - below the Fed's inflation target. Additionally, the Commerce Department said Thursday that the broadest measure of U.S. trade rose during the first quarter to the highest point in more than a year. Much of the widening deficit was due to higher prices on imported oil during the first three months of the year. Those prices have since come down. And a private research group said its gauge of future economic activity rose 0.4 percent in May, signaling slow growth in the U.S. economy through the fall. Turmoil in stock markets and a troubled housing market weighed on the Conference Board's leading economic index, while measures related to interest rates and an increasing amount of money in the economy tugged it higher. The index is designed to forecast activity in the next three to six months. Still, layoffs remain one of the biggest concerns for the recovery. Just this week, casino owner Wynn Resorts laid off more than 260 workers in its two Las Vegas casino hotels in a move expected to save nearly $8 million. The number of people continuing to claim benefits rose by 88,000 to 4.57 million. That doesn't include about 5.2 million people who receive extended benefits paid for by the federal government. Congress has added 73 weeks of extra benefits on top of the 26 weeks typically provided by states. All told, about 9.7 million people received unemployment insurance in the week ending May 29, the most recent data available. The extended benefit program expired this month. The House has approved an extension of the benefits through November. The Senate has yet to act. On Wednesday, Senate Republicans and a dozen Democratic defectors rejected a catchall measure combining jobless aid for the long-term unemployed, aid to cash-strapped state governments and the renewal of dozens of popular tax breaks. Despite the loss, Democratic leaders predicted that a scaled-back version of the measure could pass, possibly later this week. Adding to worries about the job market, the Labor Department said earlier this month that the economy generated only 41,000 private-sector jobs in May. That was down from 218,000 in April. Temporary hiring by the Census Bureau added another 411,000 jobs. The unemployment rate fell to 9.7 percent from 9.9 percent.